Bed & Breakfast Krappel in Rohrendorf near Krems. Staying with Gerda & Christian in Lower Austria. Just near my little home town Straß im Straßertal, you will find a true gem of a place in Rohrendorf near Krems: The Bed & Breakfast of the Krappel family. Stay here if you prefer a home-cooked meal, as well as home-made brandies, to the often impersonal service of a hotel. Gerda & Christian really know how to look after their guests, many of which have come back as regular guests over the years. It’s a lovely area looking out the window, too: You are surrounded by wine-terraced loess hills of the Kremstal wine growing area here, and spoiled to the comfort of having your own garden while on holiday. ...and rather lovely wine growing area Kremstal where you can live & breathe a piece of the local area history, and farming culture, have a delicious, home-made breakfast meal, sometimes even together with your hosts learn more about the area (Christian Krappel here does wine-guided tours throughout the region as well) and stay at the family house and garden near Krems, Lower Austria. “We enjoy opening our guest kitchen for our visitors. Come and have a look here, Elena”, Christian invites me in, taking a look around the house & garden together with his wife Gerda. Countless brandies, liqueurs & juices line up in front of me, many of which are home-made by the couple, and served during breakfast or for an aperitif. I can only recommend you to stay here should you visit the Kremstal and Krems area, and perhaps you’ll even get a chance to watch the master distiller at work: Christian does regular distilling right here, and has received many awards for his tasty produce and brandies. 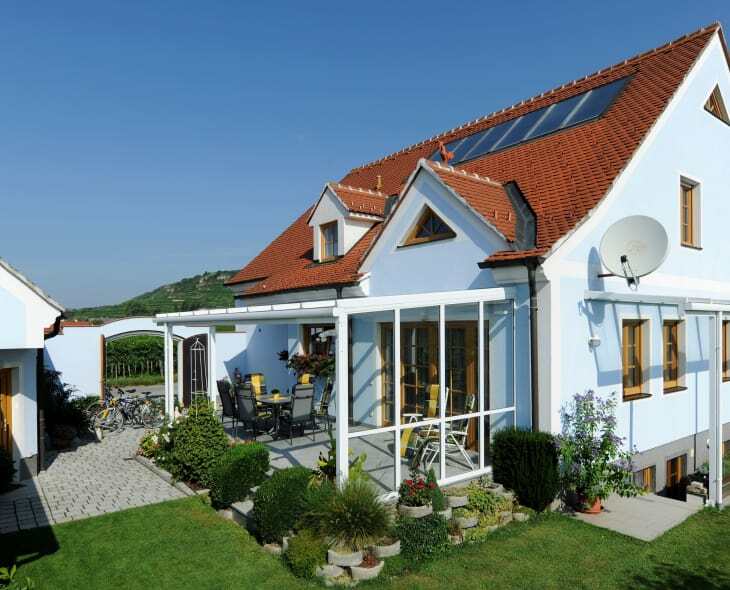 In addition, the bed & breakfast has received “Four Suns” as a quality mark by the Lower Austrian Farm Holiday Association. Just in case you need more reasons to come, even …! The tasting cuisine on the first floor of the bed & breakfast run by the Krappel family. Christian “wears” his many awards and distinguished brandies with pride. The label CK (not Calvin Klein, but Christian Krappel!) evoking a sense of quality within the region, there is a wine fridge in every guest room, too and yes - many a reasons to come and stay! Especially now during spring, as flowers and the first leaves of the vines are back! Thank you so much for the lovely visit, dear Gerda, dear Christian!